Careers in aerospace are mainly in the public sector, but the entry of a few private players has thrown up more opportunities. Manasa Janaki, 24, spends most of her day in a helicopter cabin. Though she wanted to be a pilot, she eventually yielded to her parents' wishes and studied engineering instead. But in a happy compromise which keeps her connected with the skies, she chose aeronautical engineering, enrolling at the Institute of Aeronautical Engineering, Hyderabad, and is today helping build the spacious cabins of Sikorsky S-92 - the four-bladed twin-engine helicopters made by US-based Sikorsky Aircraft Corp. Peering through her safety goggles, ticking off details on a file in her hand, she seems to enjoy her work. She sits inside a partially ready S-92 cabin at a facility set up under a joint venture between Sikorsky and Tata Advanced Systems Ltd (TASL) on the outskirts of Hyderabad. The unit makes helicopter cabins, which are then shipped to Sikorsky for final assembly. TASL, set up in 2007, is the Tata Group arm working with the national security and defence sectors. A short distance away, D. Radhakrishna, a worksman or technical worker (called an 'associate' within the company), is fixing the electrical cables. Radhakrishna, 22, who trained as an electrician at the Industrial Training Institute (ITI) in Visakhapatnam, says he is also simultaneously pursuing a BCom degree. "There are three factories here, employing 1,300 people," says Masood Hussainy, Head of Aero Structures Business, TASL. "Around 400 are involved in the making of the helicopter cabins, an equal number make various parts for the cabin and the remaining make the empennage (the tail of the aircraft)." For worksmen roles, the company hires from the ITIs, while for aerospace engineers it looks at the Indian Institutes of Technology (IITs) and other leading engineering colleges. Demand for both kinds of professionals is growing. "Against six companies which came to our campus last year looking for aeronautical engineers, 11 did so this year," says Debasish Ghose, Chairman and Professor of the Aerospace Engineering Department at the Indian Institute of Science (IISc), Bangalore. "They include companies like Airbus and GE,"
Among the IITs, Bombay, Madras and Kharagpur have been in the forefront of offering courses in aerospace. The Department of Aerospace Engineering at IIT Bombay, for instance, has 22 full-time faculty members and an annual intake of 65 students each at both the undergraduate and postgraduate levels. "Most job opportunities still lie in the public sector," says S.D. Sharma, who heads the department. But change is in the air. "Till a few years ago, this field was largely confined to opportunities in defence establishments like DRDO (Defence Research and Development Organisation), Bharat Dynamics and HAL (Hindustan Aeronautics Ltd)." adds IISc's Ghose. 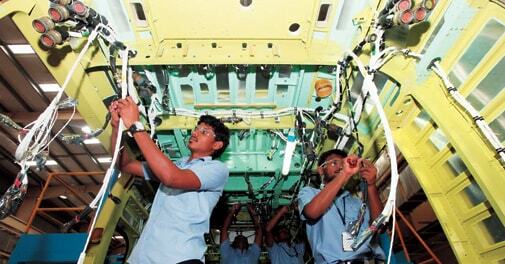 "But now private sector jobs are increasing with the likes of GE, Airbus and Boeing looking at research out of India." Sharma notes that if more companies follow in the footsteps of Airbus, Boeing and GE, more opportunities will open up. Among other private employers, the Mahindra Group has about 2,000 people in aerospace engineering and related technologies. Its vision statement for the aerospace business claims it intends to expand its "portfolio of utility aircraft to fulfil global demands, and become a Tier-I supplier of aircraft structural components and assemblies to the world market". Mahindra Aerospace, the group's aircraft and components manufacturing arm, plans to produce the first eight-seater aircraft in India in the next two years. "Aerospace is a good career opportunity as players in this space will be increasingly looking to combine aerospace engineering capabilities with the knowledge of enabling IT technology like cloud, mobility, networking and analytics to provide the next level of advanced innovative solutions," says Ramaseshan Satagopan, Head of Aerospace and Defence at Tech Mahindra Ltd. These would lead to significant savings for airlines in the areas of maintenance, repair and overhaul, he adds. TASL's Hussainy harps on the need for greater industry-academia linkages in this field, which would make education more 'practical'. He also notes that some specialised programmes, which are being provided to new recruits by companies, could be taught at the institutes to prepare students better. The lack of sufficient trained faculty, however, is a problem. Institutions such as the IISc and IITs are able to attract faculty from overseas and also hire some of their former students. Not so the new institutes that look to offer aerospace-related courses. IISc's Ghose also notes that the big attraction of his institute is not just its brand name, but the liberal seed grant it provides many of its faculty members to set up their own labs and undertake research. The newer ones cannot afford this. Finally, scope for sweeping innovation in this field may be limited, warn veterans. Since the lifecycle of products is long - a civilian aircraft's design may remain broadly unchanged for 30 years, for example - not many aeronautical engineers get a chance to work on a brand new platform or aircraft design too often. The job is just to tweak an existing design or focus on how to make things cheaper and easier.